We continue our account of the end-of-the-school year picnic at the one-room Oak Grove School in Crawford County in the 1940s and 1950s. After the pot luck lunch, the younger kids are involved in sack races or three-legged race. A young mother, older sister, or high school student was in charge. Camelia Rosenbaum performed that duty for several years. Competitors in the sack race hop into a gunny sack. Gunny sacks were burlap sacks made from jute or hemp plants, Oats and wheat for planting came in gunny sacks. Potatoes were sold in gunny sacks. Strong, durable, breathable, as the fabric was not close woven. Every farmer had a plentiful supply. All the sixth, seventh, and eighth grade kids get on the designed line, the finish line about 60 feet away. Most were girls. The boys played softball. The sack race is held on the north side of the school, opposite the softball diamond where the older boys and men are battling. Sixty feet is about all there is between Sutton’s corn field and the road. Camelia: “Get ready, set, go”, and off they went. Parents and kids cheering. One kid took one step, fell down, got up, two more steps, fell down again. One kid made it halfway. RuthAnn Mahan and Mary Lou Rosenbaum are in a dead heat. Each gets a small cheering section. “Come on, Mary Ann”. “Go, Mary Lou”, Mary Lou is ahead but looks around, then trips and falls. RuthAnn wins and gets a candy bar prize. Next, the smaller kids sack race. Each kid climbs into a gunny sack. The sack goes over the head of small of the wee ones. The little kids sack race is the best show in town. They’re all falling down, getting up, struggling on. The youngest Kozelka kids starts crying. She’s out of the race. One of the Lucy twins win. All get a sucker to lip as a prize. Next, the three-legged race. Great fun and lots of excitement. Two team members pair up based on height. Stand next to each other, and the left leg on one kid is bound to the right leg of their partner with a short piece of binder twine. Cooperation was key to winning, not speed. Winners in this short 40-foot sprint were those that did not fall over. We loved this game. Usually had about 6 pairs running a race. Time for the mid-afternoon picnic break. That meant ice cream and cake. It was up to the teacher to buy the ice cream. We didn’t get ice cream at Oak Grove School except at picnic time. No refrigerator or freezer. Teacher brought the ice cream to school the Sunday morning of the picnic packed in dry ice. We kids loved playing with the dry ice as much as eating the ice cream. Put it dry ice down the back of another kid and watch ‘em scream. Along about 4 o’clock it was pack up time. Mothers tried to get rid of food that had not been eaten. Women gather up the dishes, silverware, and cups. Families piled into their cars. All the Scheckel kids and Dad and Mom got into the black Chevy and headed southeast on Oak Grove Ridge road. 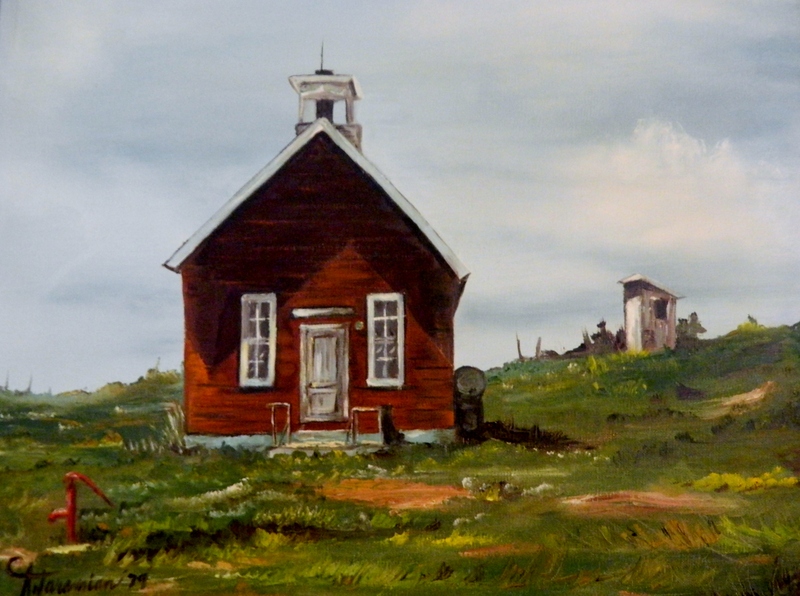 I took one backward look at the receding school house, knowing that this lone structure would be a very quiet place for 3 months. The grass and weeds would grow 2 to 3 feet high. But we knew we would be back. What a wonderful place, that lone building on Oak Grove Ridge in Seneca township in the middle of Crawford County, Wisconsin.